Kristina Rai, Director of Human Capital Development Centre, Bank Negara Malaysia (BNM), Dr. Alfred Hannig, AFI Executive Director, and Norbert Mumba, AFI Deputy Executive Director are with the participants of the five-day member training on instructional strategies. 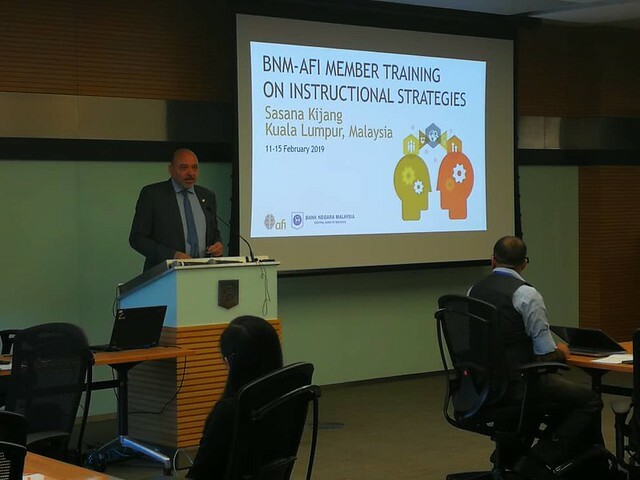 Together with Bank Negara Malaysia (BNM), the Alliance for Financial Inclusion (AFI) kicked off the first Capacity Building event of the year, Member Training on Instructional Strategies — taking place from 11-15 February in Kuala Lumpur, Malaysia. Conducted for the second year in row, the five-day member training is gathering participants from 10 member institutions, from regions of Latin America and the Caribbean, Asia, Sub-Saharan Africa and the Pacific. The participants are selected AFI members who play a key role in the design and delivery of AFI programs. “It’s our job to expedite learning; help people develop,” remarked Kristina Rai, Director of Human Capital Development Centre, BNM during the opening of the training. She explained that the training is transcending a new realm of learning, which is to learn through experiences of others. “Learning is more specialized, and we need to tailor it for individuals,” she told participants adding that they will now learn how to bring the knowledge and methodology together. “What Capacity Building brings, must enter our institutions; what you do here, translates into your work and makes it sustainable,” Dr. Hannig explained adding that through capacity building, AFI is supporting its members in their in-country implementation of financial inclusion policies. The success of AFI initiatives rest equally on two pillars — quality content and effective delivery. The five-day Member Training on Instructional Strategies, aims to address the needs of AFI members in ensuring AFI programs are not merely focused on thematic areas. The member training will also drive the importance of time management as a core component when crafting the agenda. Over the next five days, trainer Armi Stephanie Treñas, President and Principal Consultant from Learning and Performance Partners Inc. will guide participants through a series of exercises in conducting a learning needs assessment, developing session objectives, identifying effective content delivery methods and more. “To learn deeply, to teach simply,” Armi Stephanie said as she opened the first session of the training.